Pageant competitors of all ages love Rachel Allen pageant dresses for their elegant, timeless appeal and impeccable attention to detail, and Pageant Designs offers a wide selection of these stylish dresses in sizes and designs to complement any wearer. Whether you're looking for the perfect first dress for your little one, a glamorous gown for your own pageant or simply something to wear to a formal occasion, you'll find it in a one-of-a-kind Rachel Allen dress. 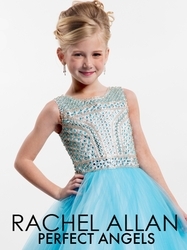 The Rachel Allen Perfect Angels collection includes child-sized pageant dresses for little girls' pageants. These dresses come in sizes 2 through 14, and they feature gorgeous colors like rich turquoise, soft pink and angelic white. For adults, the Rachel Allen Prima Donna collection is filled with ornate beading, sequined details and moody, jewel-tone colors that will dazzle during the formalwear competition.� With slim bodices and long, fluid skirts featuring the occasional thigh-high slit, these Rachel Allen adult pageant dresses will make you look and feel flawless. The brand's design team is always ahead of the current pageant dress trends, often mixing designs, fabrics and ornaments to create dresses that are unique yet still comfortable and easy to wear.